Radioactive fallout killed up to 690,000 Americans from 1951 to 1973. In the 1950s, the U.S. government downplayed the danger of radioactive fallout, asserting that all radioactivity was confined to the Nevada test site. Despite this, a national estimate attributed 49,000 cancer deaths to nuclear testing in the area. But the results of new research suggest that this number is woefully inaccurate. Using a novel method, and today’s improved understanding of radioactive fallout, Keith Meyers from the University of Arizona discovered that U.S. nuclear testing was responsible for the deaths of at least as many — and likely more — as those killed by the nuclear bombs in Hiroshima and Nagasaki. Specifically, between 340,000 and 690,000 Americans died from radioactive fallout from 1951 to 1973. Hiroshima and Nagasaki resulted in the deaths of hundreds of thousands. But new research shows that domestic U.S. nuclear tests likely killed more. The new research tracked an unlikely vector for radioactive transmission: dairy cows. The study serves as a reminder of the insidious and deadly nature of nuclear weapons. When we think of nuclear disasters, a few names probably come to mind. There’s the Chernobyl disaster, which killed around 27,000 people, although estimates are fuzzy. After Fukushima, there were no deaths due to radiation poisoning, but this event occurred relatively recently, and radiation poisoning often kills slowly over decades. When the U.S. dropped atomic bombs on Hiroshima and Nagasaki, estimates put the death toll at around 200,000 people, but again, exact numbers are difficult to calculate. One name that almost certainly didn’t come to mind is Nevada. When the Soviet Union detonated their first atomic bomb in 1949, the U.S. was shocked into action. America’s prior nuclear testing had been carried out in the Pacific, but it was logistically slow and costly to conduct tests there. In order to maintain dominance over the growing Soviet threat, the U.S. selected a 1,375 square-mile area in Nye County, Nevada. This was an ideal spot for several reasons. It was closer than Bikini Atoll. The weather was predictable and very dry, reducing the risk that radioactive fallout would be dispersed by rainstorms. It was sparsely populated. There was an understanding that there would be some amount of risk posed to nearby civilians, but it was deemed acceptable at the time. The trouble is, our understanding of radioactive fallout was still in its infancy. It was a catch-22; the only way to learn more was to test nuclear weapons. But the results of new research suggest that this number is woefully inaccurate. Using a novel method, and today’s improved understanding of radioactive fallout, Keith Meyers from the University of Arizona discovered that U.S. nuclear testing was responsible for the deaths of at least as many — and likely more — as those killed by the nuclear bombs in Hiroshima and Nagasaki. Specifically, between 340,000 and 690,000 Americans died from radioactive fallout from 1951 to 1973. Prior studies generally looked at the areas surrounded the Nevada test site and estimated the deaths caused by fallout from the area. This number was relatively low, owing to the dry, predictable weather mentioned earlier. However, the bulk of the deaths were actually dispersed throughout the country, primarily in the Midwest and Northeast regions. These deaths were caused by an unfortunate synergy between meteorology, radiation, and — perhaps oddly enough — cows. Out of all the radioactive elements produced by a nuclear explosion, iodine-131 was the biggest killer. I-131 has an eight-day half-life, tends to accumulate in the thyroid gland, and emits beta and gamma radiation. While alpha radiation is generally weak and doesn’t penetrate material very well, beta and gamma radiation are highly energetic and shoot through clothing and flesh, ripping up DNA as it goes along. Prior studies had examined the radioactive fallout dispersed by low-altitude winds, which would generally settle around the Nevada test site. However, a significant amount of I-131 was caught up in high-altitude winds. These winds carried the radioactive particles to other regions of the U.S., where it mixed with rain clouds. The now-radioactive rain fell onto the grasslands in the Midwest and Northeast. Then, cows ate the now-radioactive grass. The cows then produced radioactive milk. Dairy practices during the study period were different than they are today — most people drank milk that had recently been extracted from local cows. Thanks to a National Cancer Institute database that contains broad data on radiation exposure, Meyers was able to track the amount of I-131 found in local milk and compare this with the number and nature of deaths on a county level. In this way, Meyers was able to determine that a significant number of these deaths were due to drinking poisoned milk. These civilians would have had no idea that the milk they were drinking had been irradiated by nuclear explosions hundreds of miles away. Ironically, the area around the Nevada test site didn’t have this problem. Although they too drank fresh milk from local cows, they imported hay from other parts of the country. Since their cows weren’t eating irradiated hay, the local Nevadans took in significantly less radioactive material than their less-fortunate, distant countrymen. Although our understanding of radiation and nuclear fallout is much improved since the dawn of the nuclear age, the study serves as a warning of the insidious nature of nuclear weapons. Containing nuclear fallout is challenging, even when you know where all of the vectors of radioactive transmission are. The complexity and intertwining nature of our ecological and social systems means that words like “clean,” “precise,” or “surgical” will likely never apply to nuclear weapons. NEWSWEEK, BY KASHMIRA GANDER ON 12/11/18, President Donald Trump’s administration reportedly plans to reclassify high-level radioactive waste scattered around the U.S. in order to make it easier and cheaper to dispose of. Currently, high-level radioactive waste is defined as that which is a byproduct of fuel reprocessing (where leftover fissionable material is separated from the waste) or from nuclear reactors. Low-level waste, on the other hand, represents around 90 percent of all such waste, according to the American Nuclear Society, and generally comes from facilities where radioisotopes are used, such as nuclear power stations, and local hospitals. Items often include wipes, clothes and plastic. In the U.S., 90,000 metric tons of nuclear waste is being temporarily stored as successive administrations have grappled to find a long-term solution. Storing nuclear waste safely presents a number of challenges: it needs to be protected from natural disasters, and stopped from seeping into the surrounding water and soil, while its radiation blocked. Thieves must be kept from accessing it, and so too future generations who may not understand how toxic such materials are. The Associated Press reported the agency said the reclassification would shave $40 billion off the cost of cleaning up after the production of nuclear weapons. A Department of Energy official told Newsweek it is requesting public comment on its interpretation of the meaning of the statutory term of high-level radioactive waste through the federal register. ……..
Facilities which would be affected include the country’s most highly contaminated: the Hanford Nuclear Reservation in Washington state, which takes up an area half the size of Rhode Island. Opened in 1943, the site produced the plutonium for the atomic bomb dropped on Nagasaki, Japan in 1945, according to its website. The production of nuclear materials carried on until 1987, leaving behind waste that threatened the local environment, prompting the state and federal authorities — including the Department of Energy, the Environmental Protection Agency — to pledge in 1987 to clean up the site, without success. Other facilities mentioned in the plans are the Savannah River Plant, South Carolina and the Idaho National Laboratory, according to the Associated Press……. Open AccessPublished:December, 20 As the Planetary Health Alliance moves forward after a productive second annual meeting, a discussion on the rapid global proliferation of artificial electromagnetic fields would now be apt. The most notable is the blanket of radiofrequency electromagnetic radiation, largely microwave radiation generated for wireless communication and surveillance technologies, as mounting scientific evidence suggests that prolonged exposure to radiofrequency electromagnetic radiation has serious biological and health effects. However, public exposure regulations in most countries continue to be based on the guidelines of the International Commission on Non-Ionizing Radiation Protection and Institute of Electrical and Electronics Engineers, which were established in the 1990s on the belief that only acute thermal effects are hazardous. Prevention of tissue heating by radiofrequency electromagnetic radiation is now proven to be ineffective in preventing biochemical and physiological interference. For example, acute non-thermal exposure has been shown to alter human brain metabolism by NIH scientists, electrical activity in the brain, and systemic immune responses. Chronic exposure has been associated with increased oxidative stress and DNA damage and cancer risk. Laboratory studies, including large rodent studies by the US National Toxicology Program and Ramazzini Institute of Italy, confirm these biological and health effects in vivo. As we address the threats to human health from the changing environmental conditions due to human activity, the increasing exposure to artificial electromagnetic radiation needs to be included in this discussion. Due to the exponential increase in the use of wireless personal communication devices (eg, mobile or cordless phones and WiFi or Bluetooth-enabled devices) and the infrastructure facilitating them, levels of exposure to radiofrequency electromagnetic radiation around the 1 GHz frequency band, which is mostly used for modern wireless communications, have increased from extremely low natural levels by about 1018 times (figure). Radiofrequency electromagnetic radiation is also used for radar, security scanners, smart meters, and medical equipment (MRI, diathermy, and radiofrequency ablation). It is plausibly the most rapidly increasing anthropogenic environmental exposure since the mid-20th century, and levels will surge considerably again, as technologies like the Internet of Things and 5G add millions more radiofrequency transmitters around us. At the Oceania Radiofrequency Scientific Advisory Association, an independent scientific organisation, volunteering scientists have constructed the world’s largest categorised online database of peer-reviewed studies on radiofrequency electromagnetic radiation and other man-made electromagnetic fields of lower frequencies. A recent evaluation of 2266 studies (including in-vitro and in-vivo studies in human, animal, and plant experimental systems and population studies) found that most studies (n=1546, 68·2%) have demonstrated significant biological or health effects associated with exposure to anthropogenic electromagnetic fields. We have published our preliminary data on radiofrequency electromagnetic radiation, which shows that 89% (216 of 242) of experimental studies that investigated oxidative stress endpoints showed significant effects. This weight of scientific evidence refutes the prominent claim that the deployment of wireless technologies poses no health risks at the currently permitted non-thermal radiofrequency exposure levels. Instead, the evidence supports the International EMF Scientist Appeal by 244 scientists from 41 countries who have published on the subject in peer-reviewed literature and collectively petitioned the WHO and the UN for immediate measures to reduce public exposure to artificial electromagnetic fields and radiation. Evidence also exists of the effects of radiofrequency electromagnetic radiation on flora and fauna. For example, the reported global reduction in bees and other insects is plausibly linked to the increased radiofrequency electromagnetic radiation in the environment. Honeybees are among the species that use magnetoreception, which is sensitive to anthropogenic electromagnetic fields, for navigation. Man-made electromagnetic fields range from extremely low frequency (associated with electricity supplies and electrical appliances) to low, medium, high, and extremely high frequency (mostly associated with wireless communication). The potential effects of these anthropogenic electromagnetic fields on natural electromagnetic fields, such as the Schumann Resonance that controls the weather and climate, have not been properly studied. Similarly, we do not adequately understand the effects of anthropogenic radiofrequency electromagnetic radiation on other natural and man-made atmospheric components or the ionosphere. It has been widely claimed that radiofrequency electromagnetic radiation, being non-ionising radiation, does not possess enough photon energy to cause DNA damage. This has now been proven wrong experimentally. Radiofrequency electromagnetic radiation causes DNA damage apparently through oxidative stress, similar to near-UV radiation, which was also long thought to be harmless. At a time when environmental health scientists tackle serious global issues such as climate change and chemical toxicants in public health, there is an urgent need to address so-called electrosmog. A genuine evidence-based approach to the risk assessment and regulation of anthropogenic electromagnetic fields will help the health of us all, as well as that of our planetary home. Some government health authorities have recently taken steps to reduce public exposure to radiofrequency electromagnetic radiation by regulating use of wireless devices by children and recommending preferential use of wired communication devices in general, but this ought to be a coordinated international effort. We declare no competing interests. We thank Alasdair Philips for assistance with the figure and Victor Leach and Steve Weller for assistance with the ORSAA Database, which has enabled our overview of the scientific evidence in this area of research. After various complaints and talking with numerous concerned parents The Lancaster Weekly Review has ordered a commission in a preliminary study in order to finally answer some of the community’s concerns regarding potential toxic materials released from the Woolsey Fire as well as radiation from the Santa Susana Field Laboratory. The Field Lab was the site of a nuclear meltdown in 1959 with many locals and doctors condemning subpar cleanup efforts that point to high cancer rates which are 60% higher for those people living within a 2 mile radius of the SSFL. A lingering effect of the various toxins within the Field Labs vicinity. It appears that the recent Woolsey Fire which has devastated swathes of Ventura and northwestern Los Angeles Counties, originated at the Santa Susa Field Lab and Testing Site with varied reports to the damage to the facility as well as the contamination area of the nuclear meltdown. The Southern California Edison Chatsworth Substation which is on the SSFL site shut down 2 minutes prior to start of the Woolsey Fire. An independent study of air testing was conducted by US Nuclear Corporation of Canoga Park on Tuesday, November 13, five days after the Woolsey fire began. The owner, Mr. Bob Goldstein, was more than happy to help with the study and dispatched David Alban and Detwan Robinson to the Santa Susana Field Laboratory on Tuesday, November 13th at 3PM. They took two types of measurements for radiation with the US Nuclear Fast-Cam Air Monitor and another with a filter air tape. Twenty minute samples were taken at high flow rate of 40cfm at the Lab Entrance, which is up wind from the Lab. Another 20 minute sample was taken on the down wind side, which is North of the Lab. Given the proximity of the company’s headquarters to the Woolsey Fire US Nuclear Corporation’s team also took indoor samples at their office in Canoga Park. Mr. Goldstein also stated, “The radioactivity collected on the filters decayed down to undetectable levels within 3 hours, leading us to conclude that this radioactive material is from Radon gas which decays after a short half life.” Overall, the tests that were conducted found that the area’s Radon levels are about 3 times higher than the surrounding San Fernando Valley. Additional independent testing of other contaminants and toxins will take place in the coming days and will be published as soon as testing has taken place. Body-scanned inmates will get radiation exposure stats, NY Post By Rich Calder and Tamar Lapin, November 8, 2018 “………The city Health Department has issued new regulations that would allow inmates to learn how much radiation they’ve absorbed from body scans in the clink.Upon request, the Correction Department would have to provide them with their “total accumulated radiation exposure,” according to a legal notice issued by the city Thursday. The regulation was in response to a new state law authorizing correction officers to again use high-powered body scanners to spot nonmetal objects — such as ceramic knives — in the possession of inmates. The Correction Department thought it had the problem solved in 2012 and 2013, after it purchased five “airport-style” body scanners with ionizing radiation that picked up every imaginable kind of weapon and contraband. DOE proposes reclassifying high-level nuclear waste, could send more to WIPP Adrian C Hedden, Carlsbad Current-Argus Nov. 2, 2018 A proposal to re-characterize high-level nuclear waste could bring more waste to the Waste Isolation Pilot Plant. The U.S. Department of Energy posted a notice in the federal register in October, requesting public comment on the potential change. If approved, the DOE would change how it labels high level waste (HLW), allowing some of the waste resulting from processing nuclear fuel to be characterized as either low-level or transuranic (TRU) waste. When the HLW is held at the site, the federal government pays for the facility’s utilities, costing tax payers billions of dollars a year, Heaton said. Some of that money could be saved, he said, if the waste was moved. Don Hancock, director of the Nuclear Waste Program at the Southwest Research and Information Center said the proposal is not only illegal, but hypocritical. He said HLW is defined numerous times in laws passed by the U.S. Congress, and the DOE’s proposal would circumvent congressional powers. Hancock also said that if waste is truly less dangerous than previously thought, it could be safely kept where it is. If it’s more dangerous to keep the waste at the generator sites, Hancock said the DOE should petition for more repositories. All HLW must be sent to a geologic repository, per federal law, excluding WIPP which is licensed for TRU waste. Aside from re-characterizing HLW as TRU waste, Hancock said the proposal was also intended to get around the law requiring HLW to go underground, by re-characterizing it as low-level waste. Uncertainty remains about risk to humans who experience much lower radio wave doses, Independent, Alex Matthews-King, Health Correspondent 2 Nov 18, A long-running US study on the effects of radio wave radiation, the sort emitted by mobile phones, has found “clear evidence” of high levels of exposure and heart cancers in male rats. Some evidence of links to brain and adrenal gland tumours was also found in male rats, but in female rodents and male mice signs of cancer weren’t clear, the National Toxicology Programme (NTP) concluded in its final report on Thursday. The programme is run by the US Department of Health and Human Services and was tasked with reviewing the toxicity of mobile phone radiation in response to the devices’ near ubiquity in modern life. Radiation exposure in the trial was well above the levels most humans would experience, but researchers said the findings show the link between radio frequencies and tumours – at least for rats – “is real”. “The exposures used in the studies cannot be compared directly to the exposure that humans experience when using a cell phone,” said Dr John Bucher, a senior scientist at the NTP. “In our studies, rats and mice received radio frequency radiation across their whole bodies. By contrast, people are mostly exposed in specific local tissues close to where they hold the phone. “In addition, the exposure levels and durations in our studies were greater than what people experience.”……….. In fact, the National Academies’ Nuclear and Radiation Studies Board, the International Council on Radiation Protection, and other international bodies and regulators all use the LNT model for guidance and radiation protection. Scientist-in-Residence and Adjunct Professor, Middlebury Institute of International Studies at Monterey, October 19, 2018 The Takata Corporation sold defective air bag inflators that resulted in the death of 16 people in the United States and a massive recall of cars. While it was rare for the air bags to fail, the brutal consequences of this defective device in even minor collisions was easy to recognize. But the effects of low-dose ionizing radiation – high energy waves or particles that can strip electrons from atoms and physically damage cells and the DNA within – on people’s health is much harder to see, and prove. When the Associated Press reported that the Trump administration’s Environmental Protection Agency solicited the advice of a controversial toxicologist, Edward Calabrese, to consider changes to how it regulates radiation, it sent shock waves through the radiation protection community. 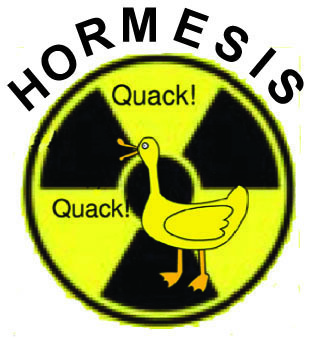 Calabrese is well known for his unconventional and outlying view that low-dose radiation is not dangerous.It is important to note that the health effects of high doses of radiation are well established. We all know about the horrific effects based on studies of the populations of Hiroshima and Nagasaki after the atomic bombs were dropped. Then there was also the recent case of Russian defector Alexander Litvenenko who quickly sickened and died 23 days after being poisoned with the radioactive isotope polonium-210 in 2006.However, the effects of low doses of radiation are not well understood. Part of the reason is that these low doses are difficult to measure. Current understanding of the health effect of radiation relies primarily on a decades-long study of the survivors of the Hiroshima and Nagasaki atomic bomb attacks. That population was exposed to a one-time large dose of radiation, with individual exposure dependent on where they were at the time of the explosion. In those high-dose radiation studies, researchers found that there is a proportionate relationship between dose and effect. The way the EPA gauges the effect of low doses of radiation draws from these studies as well as studies following other incidents. The current guidelines for the EPA adhere to what is called the linear no-threshold (LNT) model, which implies that even low doses of radiation have an effect across a population. Some scientists dubbed it to be a “reverse lottery,” where an unlucky few within a given population will get cancer during their lifetime due to their exposure to radiation. There have been questions as to whether the LNT model is appropriate for measuring cancer risk from low doses of radiation. That’s because when the radiation-induced cancer rate is low, and the sample size is small, there is more statistical uncertainty in the measurement. This allows more wiggle room in putting forward alternative dose- response models such as Calabrese’s, which have little scientific backing but that promise financial benefits for regulated industries. 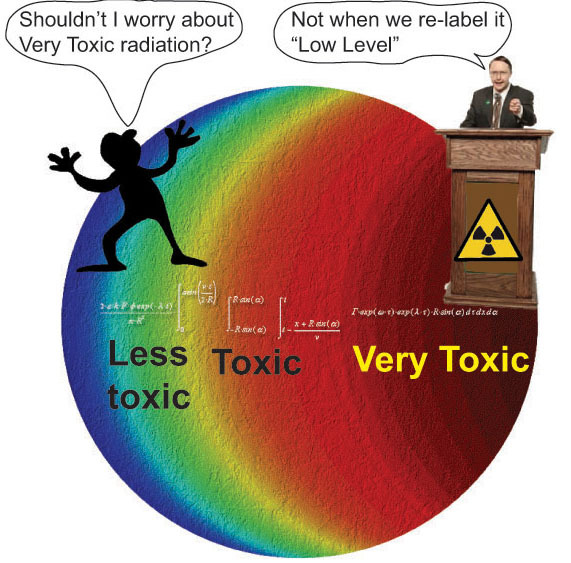 Overall, the general feeling in the radiation protection community is that for now until new research proves otherwise, the LNT model, because of the lack of understanding of the effect of low doses, is the prudent model to use to set protective limits. Also, not being able to determine the effect of a low dose of radiation is a problem in measurement, not in the underlying linear threshold model. As doses of radiation decrease, fewer cases of radiation-induced cancers occur, making it more difficult to identify those specific cases. This is especially true given that cancer is already a common occurrence, making it nearly impossible to disentangle radiation exposure from many other potential cancer risk factors. This is where the analogy with Takata air bags fails, because it is not possible to prove that a specific cancer death is due to ionizing radiation, but this does not make it any less real or significant. The EPA issues guidance and sets regulations to “limit discharges of radioactive material affecting members of the public” associated with the nuclear energy industry. The EPA defines what radiation levels are acceptable for a protective cleanup of radioactive contamination at Superfund sites. It also provides guidance on the levels of radiation exposure that would trigger a mass evacuation. It is not surprising that certain stakeholders would welcome modifications in EPA assessment of low-dose radiation exposure given the high costs involved in preventing or cleaning up sites and in compensating victims of such exposure. From my perspective, as someone who has worked with radioactive sources, the EPA should be cognizant of the warning by the late Harvard sociologist Daniel Yankelovich that just because an effect can’t be easily quantified does not mean it is not important or does not exist.